You may think celebrities are interesting. You might believe that authors and artists have the best stories to tell. Maybe you even consider musicians to be the most intriguing people to talk to. Well, you’re absolutely wrong and we don’t mind saying it. Because it’s actually people who work at storage centres who are the most fascinating. 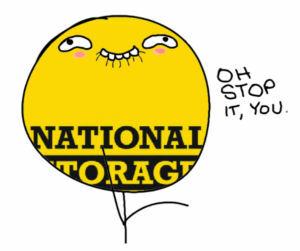 National Storage centres, to be specific. Now – lucky you – here’s your chance to get to know the team at National Storage Albion, one of our newest centres in Brisbane. Enjoy! You didn’t think a storage centre could be beautiful, did you? Well, now you know. The centre is conveniently located on Abbotsford Road. You’ll know you’re close when you see this giant frog (you really can’t miss it). This is our neighbour, Hoppy. By day, he watches cars getting washed. By night, he visits your nightmares. Albion offers over 30 unit sizes, ranging from a petite 1.2m2 to a spacious 33.9m2. Albion also has a unique ‘Manhattan’ unit. It’s aptly named for its loft-like layout – perfect for suitcases, a few boxes, and other bits and pieces. Security is serious here. The centre has 24-hour CCTV, individually alarmed doors, PIN-coded doors and PIN-coded elevators (like we always say: double PIN = double WIN*). *We’ve literally never said this before. The Albion centre was purpose-built brand new earlier this year, and it offers humidity-controlled units (perfect for storing things like books, video games and stamp collections). *Update: Since this post was published, Teisha has joined the team! Meet her at the end of this article. What’s the strangest thing Priscilla has seen someone use their storage unit for? A customer once wanted to deck out their unit with tanks to start breeding and selling fish. Sadly, Priscilla had to turn this entrepreneur away because live animals are one of the things you can’t put into self-storage. Another customer turned their unit into a photography studio – lighting, cameras, backdrops, models… the full production! Discover other interesting things people have used their storage unit for in our Self-Storage Stories. Which item in the Box Shop matches Priscilla’s personality? What’s Priscilla’s favourite thing about working for National Storage? The people. After moving to the mainland from Tassie, Priscilla says the National Storage team have been like a second family. Hey, that’s not a new staff member! It’s just a regular tea chest carton that’s been carelessly left in the middle of the room. What… wait a second. What’s going on? Is there something in this tea chest carton? Oh, it is Teisha after all. She was hiding in the tea chest carton. What a riot! Meet Priscilla and Teisha for yourself at National Storage Albion.